Helen has made some food for Clarrie and Ryan because Dorothy is away. She tells Jim it's because she wants them to have at least one good meal whilst Dorothy is away. 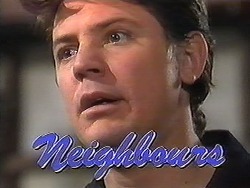 Jim teases her; that Clarrie is a good guy but Helen assures him it's just for Dorothy! 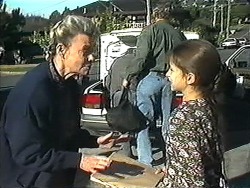 Helen takes the meal away and Beverly returns with her cases. Jim tells her she didn't need to knock – this is her home. They establish that they're alone and Beverly suggests unpacking suitcases, although I don't think that's what Jim had in mind! Helen has brought around the casserole. Clarrie sets the table and says he's not sure if they'll be any left for Ryan when he returns. Clarrie talks about the girl he's having dinner with, which he'll now share this casserole with, it's OK – it's his dog, Rosie! Helen makes conversation about the darts tournament and turns down Clarrie's offer of joining him. 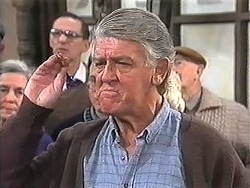 Clarrie talks about his promise to Dorothy not to drink. Helen asks if he's finding it difficult, but Clarrie simply answers that a promise is a promise. 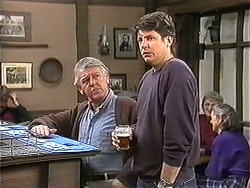 Clarrie assures Helen he's not a bad man – she should get to know him and not always believe what Dorothy tells her. 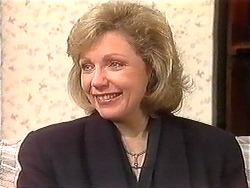 Helen goes to leave and Clarrie tries to organise a date, Helen turns him down but says maybe another time. Jim wants to place a bet on the darts tournament, Eddie is very careful about saying there are any running, but eventually gives in and Jim places his bet. 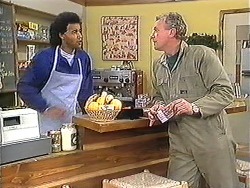 Jim leaves and Eddie goes over to Josh and says they charge for those who sit for too long without ordering. Josh asks Eddie about the friendship ring he's bought, Eddie has a look. EDDIE: Yeah, well, it's a nice thought. Don't think it'll fit me somehow though. Josh says it's for Melissa and Eddie thinks she'll be thrilled with it. Joe is doing exercising trying to psych himself up for darts! Joe tells Kerry he's going to need all his skill and lucky darts to beat his opponent. In fact, he goes to get them out now to polish them. As he does he tries to remember what Kerry told him: “the first step to becoming a winner is believing you are a winner” – and that's why he needs the darts. He can't find the darts and frantically searches for them. Kerry tries to calm him down but Joe is frantic. Melissa and Cody say hello to Josh. Melissa flashes a ring at Josh – it's a friendship ring from a special friend of hers. They've wound him up very well and Josh leaves without showing Melissa the ring he got her. Joe is searching the bins for his darts. Kerry comes out telling him to calm down, it doesn't matter if he doesn't win. Joe tells her he's superstitious and Kerry is angry to discover that there are bets running. He tells her the plan, for once he's not gambling. He was going to play poorly with normal darts in the preliminary stages then in the finals use the darts and beat his opponent so that people bet against him originally. Joe tells Kerry he owes ‘Whacker' for gardening materials and it's all got a bit complicated. 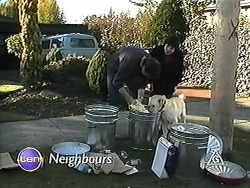 Kerry sighs and follows him over to the compost heap. Rosemary and Tracey are leaving and Jim helps them with their bags. Jim and Rosemary thank one another for their help and Helen comes out to give Tracey a yearbook of Rosemary's – it has Tracey's mum in it. Tracey thanks Helen for everything and they hug. 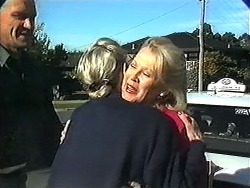 Rosemary and Helen hug and say goodbye. Rosemary and Tracey then get into the taxi and drive away. Helen makes her way inside. Josh asks Jim's advice about the friendship ring, although talks about it as ‘a friend has this problem'. Jim's advice is that Josh's ‘friend' should get a new girlfriend. Oops. Clarrie comes in for a lemonade. Joe admires him for sticking to it so far – but there's still a way to go. Clarrie says he'll win the drinking bet, the darts and if he was younger he'd win Kerry away from Joe too! Joe takes Eddie aside whilst laughing at Clarrie telling him he'll win the darts. He tells Eddie he's los this lucky darts, but Eddie hopes they stay vanished as there have been loads of bets from Whacker's mates on Joe to win – and Eddie can't afford to pay them all. Eddie says one of them is in trouble, but Joe says he's the only one in trouble: without his lucky darts he won't be winning anything. Beverly comes round to see Kerry. Beverly starts talking about her pregnancy and Kerry joins in – Beverly is surprised, she didn't know Kerry was expecting! 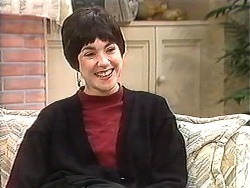 Kerry asks her to go to some pre-natal yoga classes with her and Beverly thinks that sounds good. Kerry comments that it's good to see Beverly happy again and Beverly thanks her for being such a good friend through it all. They talk about Joe and the darts – and how boys love playing games. 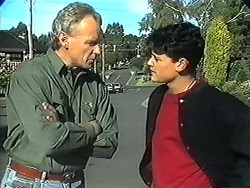 Kerry asks what Todd thinks about moving back to Ramsay Street, Beverly says he'd pleased. Jim comes in and asks Eddie how the darts is going, apparently Clarrie is off his game and it looks like Joe doesn't need his lucky darts afterall. The camera watches Clarrie who seems distracted my those around him drinking beer! He throws some bad shots and then leaves. Joe comments that he never had Clarrie down as a bad sport. Melissa approaches Josh who is sitting on a bench. She tells him that the whole thing earlier was something her and Cody constructed, she was trying to worry him into thinking she was with someone else and trying to make him jealous. They talk about Josh and his computer games and Josh says that she's much more important to him than the computer games. Melissa asks if he'd give them up for her – and he would. She says she wouldn't ask him to do that because that's who he is but she wishes that something he was a bit more romantic. As she says that he presents her with the friendship ring. She's delighted and they kiss. Clarrie has come to return the casserole dish. He flatters Helen telling her it's the best he's had and any chef would be pleased of the recipe. He brings up the idea of a date again – tonight. Helen says, as she told him before, she's busy tonight. Clarrie says that he understands that a fantastic woman like herself needs booking in advance – tomorrow night. 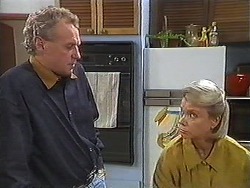 Helen reminds him of the darts tournament, but Clarrie says he's pulled out of it – she's much more interesting anyway. 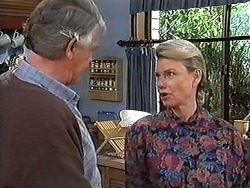 Helen is still unsure so Clarrie says they'll discuss it over a cup of tea. We're in the toilets with Joe and Eddie! Eddie bangs on the door urging Joe to hurry up. Joe says he's psyching himself up. Eddie tries to get him to come out – the crowd and his opponent are getting restless. Eventually Joe comes out, but only after Eddie says that Whacker is about to come in with his mates. 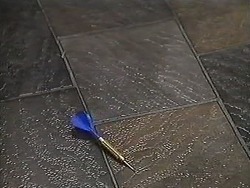 Joe opens the door and says he doesn't know what to do without his lucky darts. Toby is home early because someone was sick a the friend's he stayed at. Toby wants to go and watch Joe win at darts, but Kerry doesn't think that's a good idea – Joe doesn't think he's going to win because he can't find his lucky darts and he's upset. Toby tells Kerry he has the darts, he too them with him. They both look for them in Toby's case, Kerry hopes they can get them to Joe before it's too late. Joe takes a shot, with Eddie telling him to stay calm. He takes it and looks pleased with it, but then the dart falls out of the dart board!